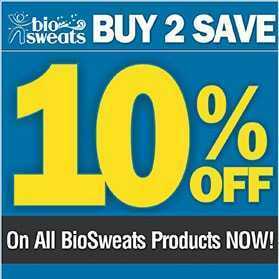 Welcome to BioSweats Products - Get Cut!...Cut-Up Don't Just Happen....BioSweats! The jackets fits which I am surprised because I'm over 300 lbs and have never been able to find a sauna jacket in my size. I can't do much as far as exercising but when I put this jacket on and just work around my yard I come in the house soaked! It feels good to sweat and lose weight! The pants are just right for running and boxing! I don't workout without them because I do not get a good sweat. I love the pants and the results! I love the jacket! It actually makes me look much smaller than I am and the sweat is incredible! I am geeked! If you want a beach body year round, buy this BioSweats sauna suit because this is the only suit that will give you an entire suit that makes you sweat like crazy which equals total body weight loss. I love the biosuit, I got one of the womens styles and my boyfriend Todd got the Unisex style. We work out together 5 days a week doing cardio and weights, I also do yoga and kickboxing in mine. We love our suits. Copyright RSG Global, LLC. All Rights Reserved.